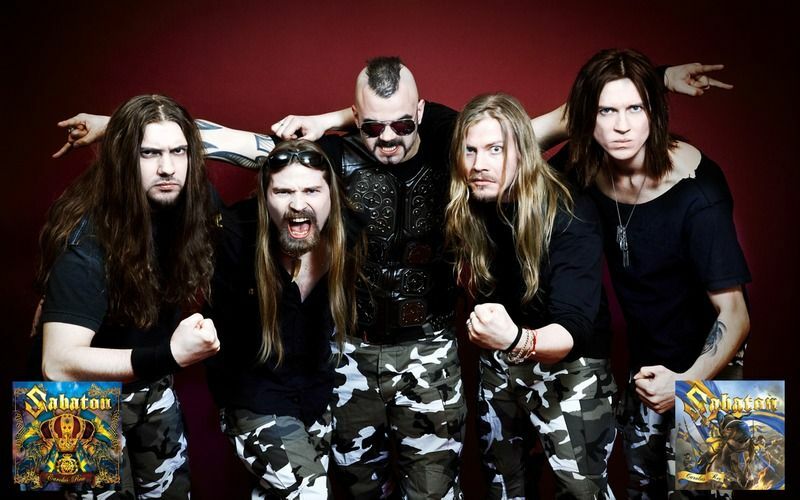 Sabaton [ˈsabaˌton] is a power metal band from Falun, Sweden formed in 1999. 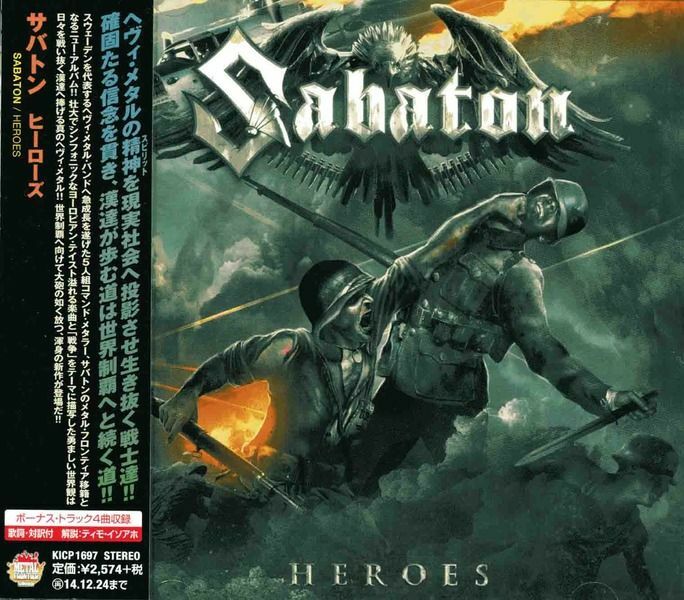 The band's main lyrical themes are based on war and historical battles. 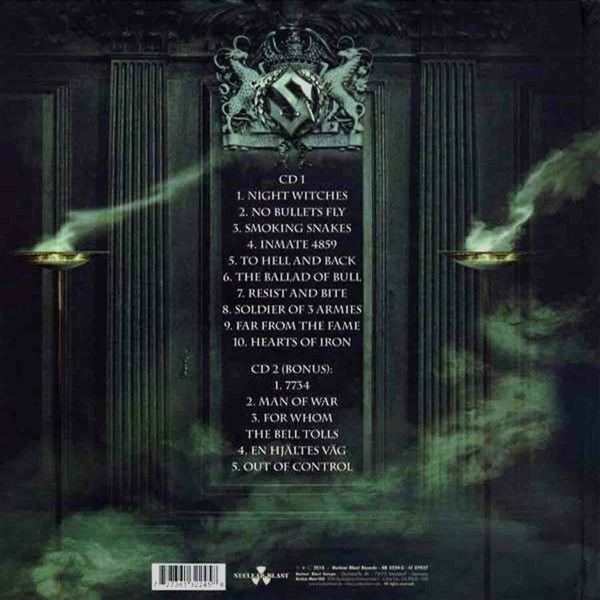 This is heard in the albums Primo Victoria, Attero Dominatus and Coat of Arms where all of the songs contain these motifs, except final tracks which are heavy metal tribute songs. Lyrical content drawn from World War I, World War II and other conflicts is prevalent and includes songs about battles and leaders on all sides of said conflicts.In April 2012 four members left the band and formed another, whilst vocalist Joakim Brodén and bassist Pär Sundström continued with new members. 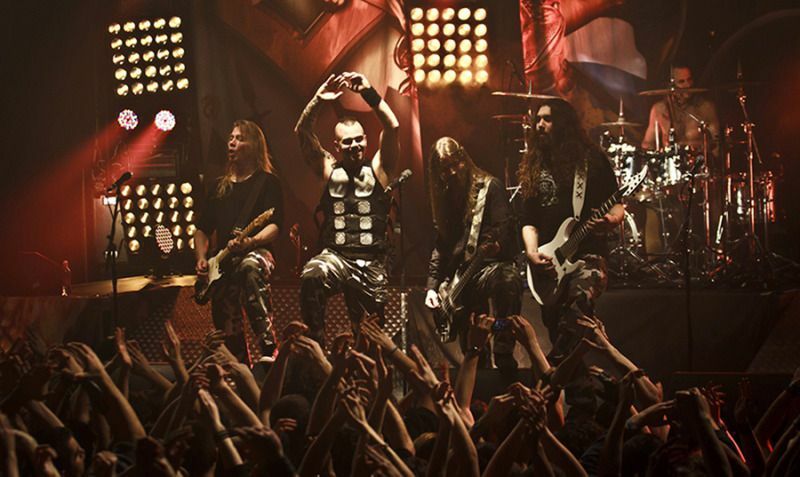 As well as extensively touring internationally the band have a festival in their home town of Falun, Sabaton Open Air, in August and an annual cruise, 'Sabaton Cruise', in November. 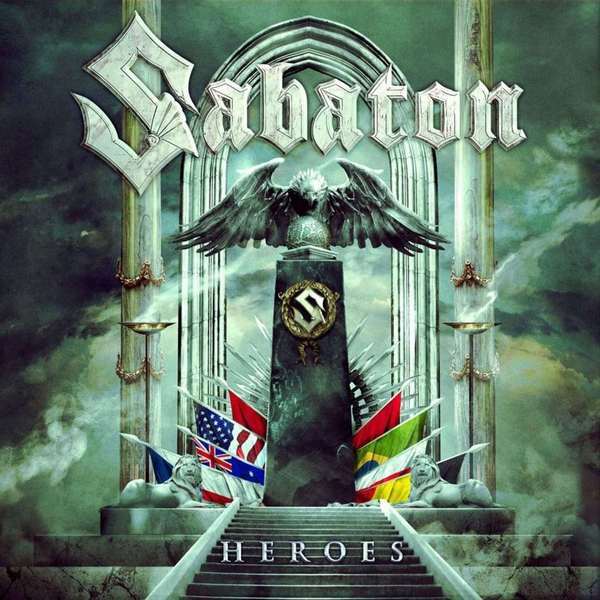 To celebrate their triumphant return to North America this spring, Swedish metallers SABATON will release a special, three-disc limited-edition deluxe version of their 2014 album, "Heroes", in the U.S. and Canada on April 7 via Nuclear Blast.Limited to 5,000 copies, this deluxe edition includes two discs of live audio recorded on the 2014 Sabaton Cruise in addition to the original ten "Heroes" album tracks.SABATON will return to North America in April/May 2015 as direct support to Finland-based symphonic metal storytellers NIGHTWISH. "Heroes" was certified gold in the group's home country for sales in excess of 20,000 copies.Note: The International Federation of the Phonographic Industry (IFPI) in Sweden has revised the sales requirements for albums to reach gold status in the country twice in the last seven years — from the pre-2002 level of 40,000 to the current 20,000. "Heroes" sold around 3,100 copies in the United States in its first week of release to debut at position No. 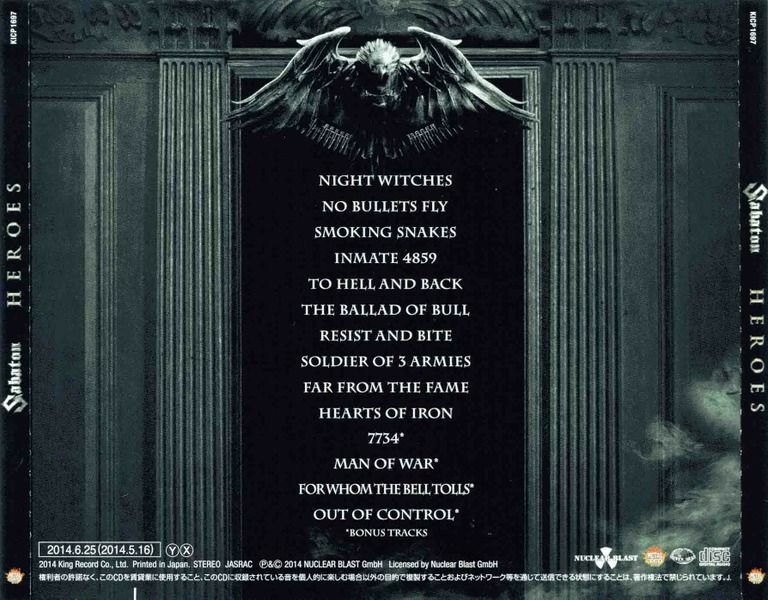 99 on The Billboard 200 chart.Released on May 16, 2014 via Nuclear Blast Records, the "Heroes" cover artwork was created by Péter Sallai. A number of bonus tracks were made available, including cover versions of songs originally written and recorded by METALLICA, BATTLE BEAST and RAUBTIER. "Heroes" was tracked at The Abyss, the recording studio in Pärlby outside Ludvika, Sweden owned and operated by record producer and musician Peter Tägtgren (HYPOCRISY, PAIN). The lush and over-sized earbook (28x28cm) includes a bonus disc with 5 exclusive tracks: amongst them cover versions of METALLICA, BATTLE BEAST and RAUBTIER! "What can we do when our band's previous album is career-defining classic and one of our home country's most successful heavy metal albums ever?" This was the million dollar question that members of Sabaton - Swedish heavy metal heroes, who have dominated European the heavy metal circuit already for years and received prestigious awards including Metal Hammer UK's Golden Gods Award for "Best Breakthrough Artist" - had to ask themselves after successful world tour promoting their sixth and platinum selling album "Carolus Rex" (2012).During this gigantic tour, heavy metal's most enthusiastic fan legions saw Sabaton playing huge stadiums with Iron Maiden - but also on their own as Sabaton performed their biggest show ever in Polish Przystanek Woodstock Festival in front of more than half a million fans and the show was - of course - filmed and later immortalized on massive "Swedish Empire Live" DVD/Blu-ray. After saying this, do we need to point out that Sabaton are nothing but superstars in Poland and the members of the band have been adopted as Polish honorary citizens?